Hi Charles Norris, can I call you Chuck... just kidding. I bet you get that a lot. Or maybe you are THE Chuck Norris, I don't know. So, when it comes to size larger is always better when it comes to testing Internet speed. The size that's right for your connection will be different from the size that's right for my connection. If you send me a the link for your results I can give you an idea of what a good size is for your connection. TestMy.net also makes suggestions. On the upload and download test pages you'll see an 'express' button. Express sizes the download based on your previous results. It usually does a good job of picking a good size without going overboard with the size.... you want it large, but not so large it's going to waste your afternoon. If you look at my screenshot you'll see the button. For me it's suggesting 44MB, which fluctuates as tests are performed. 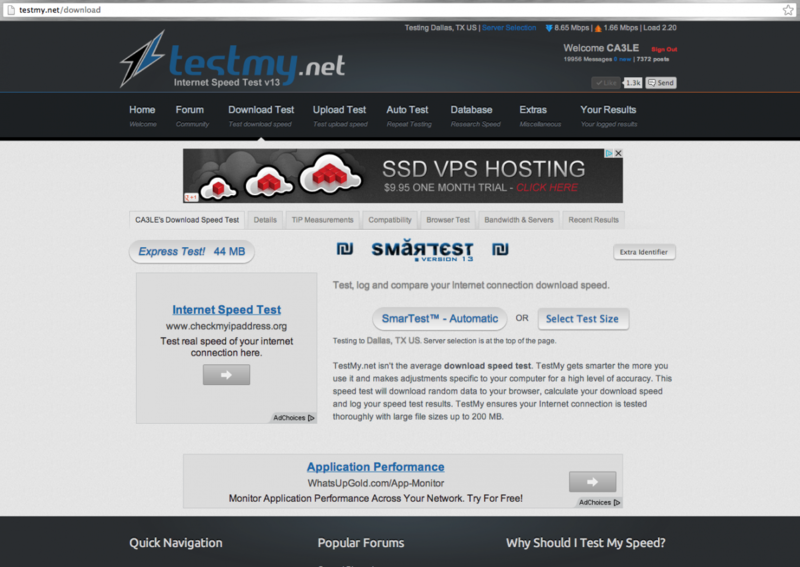 The button on the homepage that says "Test My Speed" (now says "Test My Internet") also uses the express feature when applicable. Although it tests both upload and download... in my opinion you only usually need to test download speed. I hope this helps and I hope you like what I've built. Please take the time to help me spread the word if you like what you see. Thank you so much for spending your time to reply. I never noticed the "Express Button" and did not know that it gave the recommended download size. I refer to it now and have at least some kind of idea what I'm doing lol. Btw, yes I have had to deal with the jokes about my name all my life..I'm used to it I just tell them I'm the real Chuck Norris and the other one can't even act lol. No I'm not the actor karate guy. Again, thank you for taking the time out to reply. I hope you have a great time with your family and take care.